There are millions upon millions of bad sites on the web, but artists really work at it. Never have I seen such an array of sites in which artsy designs, misplaced cleverness, highbrow concepts, amateur clumsiness, arrogance and ignorance have been painstakingly employed to drive visitors away. As a result of this obvious desire of illustrators, painters, comics artists, concept designers and other artists not to be seen, I’ve created a collection of handy tips for how to send editors, art directors, gallery owners, prospective buyers, webcomics readers and casual users hastily clicking away in search of some portfolio site other than yours. Got your note pads ready? Use a “free” hosting service that only charges by making your site display pop-up ads. Hey, free is free, right? Besides, everybody loves pop up ads. Don’t bother with real web hosting from decent hosting services even though it can cost $8 a month or less, and don’t bother to look for reviews of hosting services on reputable sites like C/Net. Also ignore the fact that blogs, when used with “pages” instead of “posts” can serve as easily constructed, pre-designed and free web sites. Don’t take the trouble to get a domain name. Art directors will remember “mac.com/users/~joeblow/web/portfolio/intro.html” much more easily than “joeblowillustration.com” when they go to hire their next artist. Plus “tripod.com/members/~janedoe/paintings/gallery/thumbnails.html” is so easy to mention in conversation or recommend to someone else, and it looks great on a business card. Don’t consider the fact that domain names can cost less than $10 a year, and are often free with real web hosting accounts. Hey, the good ones are all taken or squatted on, right, so why bother? And if you do get a domain name, longer names that are more closely associated with your name or studio, and might be easier to remember, can’t possibly be a cool as bizarre, clever, short ones that have nothing to do with you or your work. Speaking of “clever” be sure to use a clever interface design and enigmatic navigation. All art directors and gallery owners love to play guessing games, and they have plenty of time to click around until they’ve figured out where on your nifty “concept site” you’ve hidden your artwork. They’ll be so impressed with your high concept that they’ll feel the art is that much more valuable when they finally find it. In fact, make them wait a bit in anticipation. Use an Intro Page, especially with a long, clever animated Flash intro that that can’t be bypassed, to make sure they’re in the right mood when they arrive at your fabulous Splash Page, the entire purpose of which is to force them to search for a tiny, almost invisible, “Enter Site” button and click on it in order to get to the Main Page, which should be as confusing as possible and from which they must choose “Creative”, or some other euphemism for “Portfolio”, in order to arrive at the Gallery Selection Page and be presented with choices for which section of the Gallery they want, hopefully named in some arcane terms only you and the members of your fan club would understand, and then choose a Sub-gallery, and ideally a Sub-sub-gallery, before showing them any images. Make them work for it so they’ll understand just how important your images are! Hey, they wouldn’t have gotten this far if they weren’t, right? Use lots of bright, intense colors in the design, particularly in the gallery area. You want to make sure the colors in your images are suppressed and overshadowed by the design. After all, the web site itself is the important thing, isn’t it? Be sure to put your site in frames! You wouldn’t want someone to be able to conveniently bookmark a page, or send a link to an individual page to, say, another art director. You want them to go through the entire navigation process everytime. Putting your entire site in a single Flash file is good for this too. As long as you’re coding, make sure your site is Internet Explorer specific. You don’t want any bums using Firefox, Mozilla, Opera, OmniWeb, UNIX, LINUX or a Mac to access your site. If they can’t get a real computer, they should get lost. Play some tricks! Use nondescript links, that unsuspecting users think are to other pages in your site, to send them without warning to eBay, your blog, a Flickr gallery or to start the unwanted download of a PDF file. What fun! Wow ’em with sound. If your visitors are in an environment where music is inappropriate, and only have their sound on so Microsoft Word can seranede them when it belches out a document, they’ll appreciate the welcome relief from boredom that your surprise music explosion brings to them, their unspecting co-workers, and their boss, who needs to loosen up anyway. On the other hand, if they’re in a sutuation where music is acceptable, they’re certain to like what you have picked out better than what’s on their iPod, and they’ll appreciate the surprise mash-up of Eine Kleine Nachtmusik and Dust in the Wind. Besides, your taste in what music they should listen to is obviously much better than theirs. If you’re creating your navigation in Flash to keep it hidden from search engines, you can add bonus sound effects to the buttons! And don’t let some namby-pamby usability expert talk you into subtle little camera shutter clicks to give user feedback when they click on a button; imagine some art director’s deilght at the button for your “About” page emitting a sound like a Star Wars light saber slicing through a jet engine housing! Don’t learn anything about usability, information design or good navigation practices. If you’re making your site yourself, you don’t want to stifle your creativity with such things, nor do you want to be aware of them if you’ve hired a “creative” web site designer or agency who has promised to make your site “cutting edge”. All that nonsense about making a site easy to use just gets in the way. Make sure you don’t read books on web site usability, like Steve Krug’s Don’t make Me Think. Don’t try to look at your site like someone who’s never been there before. Hey, you know where everything is, if some newbies can’t figure it out, screw ’em! Keep ’em guessing. The home page is the first impression visitors have of your site, Whatever you do, don’t set aside a space on the home page, or at the top of your blog, to give first time visitors a succinct description of who you are and what you do, or tell them what kind of site this is. What fun is that? In fact, do what you can to make the intro to your site as enigmatic and obscure as possible; this is très chic. 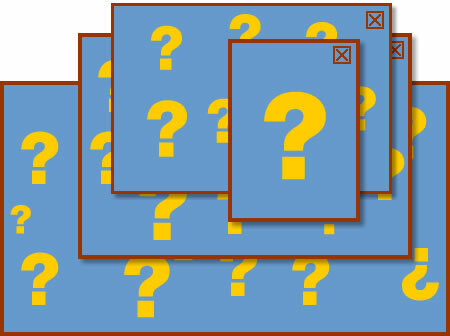 Besides, all the important people have already been to your site and know the score; and the newcomers will love the feeling that they have arrived at the gate of a clandestine private club, and will appreciate the challenge of figuring out the puzzle while they decide whether or not to apply for membership. Don’t focus! Since everybody important has already been to your site, design your home page for their benefit and fill it with the latest news of your comings and goings, or your insightful ruminations on last night’s episode of Lost. Don’t waste that wonderful home page space on introductions for strangers! Oh, and while you’re at it, make sure to cram as much as possible on your home page. It’s the most important page, right? So everything should go there. Make it long and scrolling and squeeze stuff into every corner. You don’t want any wasted white space! The more stuff vying for attention, the better! MAKE EVERY LINE A HEADLINE! Mix colors! MAKE YOUR HEADLINES LOOK LIKE LINKS! MAKE YOUR LINKS LOOK LIKE HEADLINES! Be sure to underline, italicize and bold all kinds of stuff for EMPHASIS!!. Isn’t this fun?! Don’t forget, the computer gods gave you a milliOn fOntS for a reason; it would be a sin not to use them. Once you’ve made your images inaccessible, make yourself inaccessible. Suppress any unwarranted urge you have to include a brief bio. At the very least substitute a clever “fake” bio that’s sure to leave ’em laughing. Or, if you must add a real bio, be sure to write a lengthy multi-pager with your entire life story, your views on all aspects of art, religion and politics and the details on your penchant for eating Oreos dipped in Diet Coke at 4am in your Sponge Bob underwear. Don’t include a short description of your working methods, that might be too interesting or informative. Make certain your contact information isn’t available, or be sure it’s presented as some kind of weirdly arranged interactive form, the location of which is hidden and the page for which makes it clear how much you don’t want anyone to contact you unless you already know them, because they’re obviously “fans”, and as such, beneath your notice. Most importantly, make sure the images themselves are too small to really convey any feeling for your work. Remember – all visitors to your portfolio site are malicious parasitic thieves, out to steal your precious artwork and print it on millions of knock-off T-shirts in China! Don’t give them anything that makes your work look good enough to steal!! Better yet, keep your work safe by not putting it on the web at all! If your work is in print, you need to write your senators and demand they outlaw inexpensive scanners, which can actually be used to grab a high-resolution, printable image of your art. Now that I think of it, it’s better to prevent your work from appearing in print too. Keep it at home in a drawer so no one can see it but you! See how easy it is? By following these simple rules, or just a few of them, you too can make your portfolio site as magnificently unappealing as many other artists! So grab your copy of Front Page and have at it! Addendum: Due to the overwhelming response to this article, and the many requests for information that have stemmed from it, I’ve started a less entertaining, but hopefully more directly helpful, series of articles on the subject of How to Display Your Art on the Web. I’ve featured tattoo artists on lines and colors (like Regino Gonzales), but I found it particularly fascinating that gallery artist and illustrator Shawn Barber has painted a series of portraits of individuals with tattoos, with a particular interest and emphasis on the tattoos. Often, in fact, he will focus on just hands or other body parts that are tattooed, in effect painting a portrait of the person through the vehicle of the tattoos they have chosen. The series also includes paintings of tattoo instruments and close-ups of hands involved in the action of applying tattoos. The paintings are in a crisp, immediate, realist style, sometimes left to rough edges in places, or posted in an incomplete stage, which I always enjoy. The idea of painting tattoos enters into the interesting area of artists painting their interpretation of another artist’s work. Barber also has another extensive series, I believe painted prior to the tattoo series, on the subject of baby doll heads. Most of these paintings are large scale, many are roughly 5 feet (152cm) high. Barber is also an accomplished illustrator, with clients that include The New Yorker, Rolling Stone, Atlantic Records, The Washington Post and many others. His personal work has been shown in numerous solo and group shows and his illustration has been featured in articles in ArtNews, The Artists magazine, Juxtapoz and Communication Arts. He likes to keep his personal work separate from his professional work, both in terms of intent and stylistically, though his portfolio on the Magnet Reps site has a mix of both. His own site contains mostly personal work, primarily the two series mentioned above, but the gallery is a somewhat awkward “roll-over to view” setup that requires you to keep your mouse stationary over a thumbnail to keep the corresponding image in view. The portfolio on the magnet Reps site is easier to view, but doesn’t contain the most fascinating and striking of his images. His personal site also contains an interesting FAQ, in which he talks about his schooling and artistic development, gives advice to younger artists, and lays out his strongly held opinions on a number of subjects relating to art and illustration. In addition to gallery painting and illustration, Barber has lectured and given painting demos at several universities and art schools, including the Ringling School of Art and Design, where he received his BFA,. He is currently a Professor of Illustration at the California College of Arts in San Francisco. Barber is working on a second series of tattooed portraits, and is now in a tattoo apprenticeship with tattoo artist Mike Davis of Everlasting Tattoo in San Francisco. 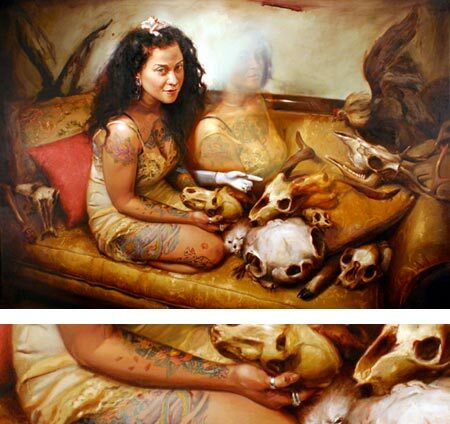 A collection of his paintings, Tattooed Portraits: New Paintings by Shawn Barber, was published in 2006. Note: The Shawn Barber site contains images that are NSFW and may be offensive to some. Now that summer has unofficially arrived, let’s look back as the quiet beauty of winter in the paintings of Fern Isabel Coppedge. 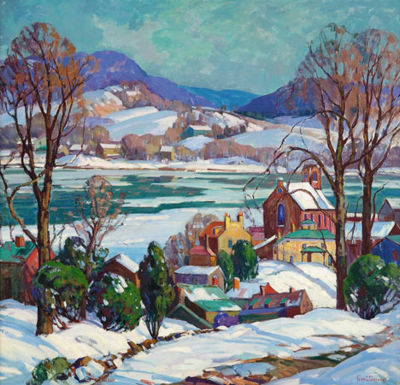 Coppedge was one of the group of painters centered around New Hope, a small town on the Delaware River in Easter Pennsylvania, around the turn of the 20th Century. These painters are collectively referred to as Pennsylvania Impressionists, and included such luminaries as Daniel Garber and Edward Redfield. Though the artists were influenced by the unconventional daring of the French Impressionists, I don’t think they referred to themselves as “Impressionists” and there was no official group as there was among the French artists. Styles among the American painters varied more and were as likely to carry the influence of academic realism as Impressionism. Coppedge was also a member of an official, though loosely tied, group called the “Philadelphia Ten“. This was a group of ten women artists who exhibited together, both in Philadelphia and in traveling exhibitions, most of whom had studied at the Philadelphia School of Design for Women (now the Moore College of Art and Design) or the Pennsylvania Academy of the Fine Arts. Coppedge studied at both, as well as at the Art Students League in New York and the Art Institute of Chicago, in her native Illinois. It was at the Pennsylvania Academy, though, that she encountered Daniel Garber, who was likely one of her instructors, and introduced her to the New Hope group of painters. She moved to New Hope and purchased a home near Garber’s. She became part of the group of New Hope painters but had one of the more independent and idiosyncratic voices among them. She shared their penchant for painting Bucks County winter landscapes and snow scenes, but showed a particular interest in village scenes with the small houses arrayed against hillsides like colored blocks. She was not a “parlor” winter painter, painting winter scenes from the window of a heated room, but, like her compatriot Edward Redfield, would go out in all manner of weather, wearing a bearskin coat, ear muffs and gloves, painting until her fingers were stiff. Though Coppedge was highly influenced by her fellow New Hope painters, she went very much her own way, developing a style that had more in common with post-Impressioninsts like Van Gogh than Monet or Pissaro. Her paintings have an element of primitivism that gives them a Rousseau-like strength and immediacy in which the normal rules of composition are ignored and almost every element in the painting has intense focus. Objects often seemed outlined where she has filled a dark shape with brighter details, leaving the edges intentionally open to form a dark outline. Paint is at times placed on the canvas with large enthusiastic strokes, giving the impression of gleeful abandon to the joy of color and shape. Coppedge developed a penchant for preternaturally bright colors, often using tube colors with little or no mixing on her central objects, giving them the highest possible chroma. Her perspective is often flattened or askew, leading, along with her almost primitive use of color, to criticism that she was technically less the proficient than the other Bucks County painters. Though her output was weakened by inconsistency, her most “primitive” works, in which objects are most flattened into areas of color, come later in her career, as she was pushing forward into her own territory, and her early work shows a technical approach more in common with her New Hope colleagues. Though I don’t know of any books specifically devoted to Coppedge’s work, she is included in collections like The Philadelphia Ten: A Women’s Artist Group 1917-1945 by Page Talbott and Patricia Tanis Sydney (out of print but available used), and the beautiful Pennsylvania Impressionism by Brian H. Peterson. For those lines and colors readers who are outside the U.S., I’ll explain that today is Memorial Day, a national holiday associated with the start of Summer, picnics, bar-b-ques and mini-vacations. More importantly, though, it is a holiday designated as a remembrance of those who have died in military service; though moving the observance from a set date to a floating Monday has put the emphasis on holiday for most Americans, and unfortunately de-emphasized the importance of its original purpose as a day to honor the fallen. I missed the PBS special They Drew Fire: Combat artists of World War II when it was broadcast in 2000. The documentary chronicles the role played by over 100 individuals who were considered “combat artists”, drawing and painting their experience of war from the field, most often from the front lines. A few were journalists, working for publications like Life Magazine and included name artists like Peter Hurd. Most, though, were military personnel, some working for military magazines like Yank, but 42 were specifically commissioned according to a special program established in 1943; and apparently included Thomas Hart Benton, who was in the U.S. Navy. You may think it odd that the US government would have the insight to realize the value of artistic vision over straightforward photography in conveying images of the war to those “fighting on the home front”, and the program was in fact torpedoed by a short sighted congress who eliminated its modest funding the next year; but the program was well-conceived and pulled no punches. The artists were instructed to portray war as they experienced it, covered in dirt and mud and blood, not the spit and polish of formal portraits. Though the formal program had its funding yanked, many of the artists continued unofficially, and other efforts to report the war by way of combat artists started up, both civilian and smaller-scale military. These artists were in the field. If landing on a beachhead, they were expected to fight like any other soldier until the beach was secured, then take up their pens and pencils and make sketches, usually to be rendered as finished paintings later under more secure circumstances. This was seen as one of the advantages of artists over photography, the photographer could only snap what was available to his lens at the moment, an artist was trained to form an impression, and could bring to bear control over lighting, composition and rendering to convey the feeling of combat perhaps more accurately in some ways than a photograph. 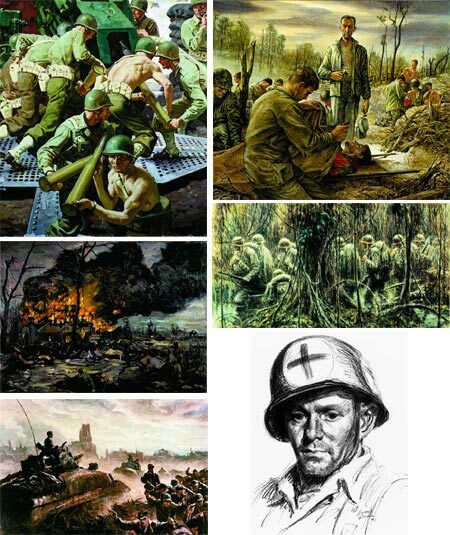 In many of the works available in the online gallery set up on the PBS site to accompany the documentary, you can see how effectively the artists have conveyed the realities of combat as they encountered them, the heroic effort, grim determination, wearyness, exhaustion and pain. (Images above, clockwise from top left: Robert Cornwell, Tom Lea, Kerr Eby, Howard Brodie, Ogden Pleissner, William Draper.) Bear in mind as you look through the gallery that these images are not the fantasies of movie or gaming concept artists, but a record of real experiences. There is also a history of the combat art programs, and information on some of the individual artists. Not mentioned is the role of cartoonists like Bill Mauldin, and the fact that, though there is no formal combat artist program today that I know of, there are artists portraying the conflict in Iraq, like civilian Steve Mumford and reservist Chris Grant. I think if we accept a picture of war as some kind of heroic John Wayne fantasy, or swallow the simplistic “us vs. them” Rah-Rah! football game mentality that governments peddle, we do our fighting men and women a terrible disservice. Only in acknowledging the true horror that we have asked them to endure do we honor their level of sacrifice on our behalf. The role of artists, as always, is to open our eyes to things we might not see otherwise. Anyone who is interested in concept art for films or games, particularly if it involves near-eastern themes in games like Prince of Persia, should be aware of 19th Century painter Jean-Léon Gérôme, if you aren’t already. Likewise, anyone with in interest in Victorian art, the Pre-Raphaelites or 19th Century academic art in general would enjoy Gérôme’s beautifully painted scenes of mosques, minarets and Eqyptian rooftops, as well as his depictions of Imperial Rome. The Victorian era fascination with the exotic cultures of Asia inspired a number of painters and became known as Orientalism. This was the artistic end of a European view of the near east, and Islamic cultures in particular, as strange, romantic and sensual. The accuracy of such views, and of the scholarly interest in the middle east, was of less importance than the appeal of the foreign and strange to the art buying elite. Plus, it was a great way to fill canvases with the eye candy of exotic costume, strange customs, and of languorous odalisques and harem concubines, smoking hookahs by reflective pools, or being proffered at slave auctions. There was plenty of that Victorian era titillation in the guise of history painting or allegory, or in this case, acceptance by virtue of the portrayal of other lands or cultures. 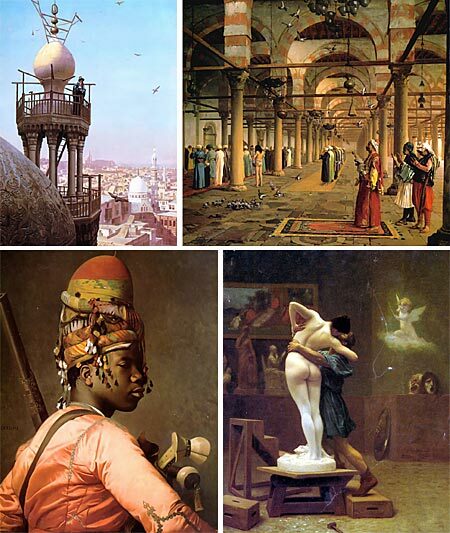 Gérôme excelled at the portrayal of these subjects, but at times exhibited an almost National Geographic style reportage of the inside of mosques and cityscapes, in contrast to his more exploitative harem scenes. Prayer in the Mosque (image above, top right), was probably painted from sketches made on one of his many trips to Egypt. The painting is in the collection of the Metropolitan Museum of Art in New York. At his best, Gérôme was a superb painter and sculptor in the neo-classical style, a student of Paul Delaroche and a teacher of such notable painters as Odilon Redon, Thomas Eakins and J. Alden Weir. At his worst he was an influential enemy of the Impressionists, and almost succeeded in convincing the French government to refuse a gift of 65 of their controversial paintings from Gustave Caillebotte (the bulk of which now form the core of the Musee d’Orsay’s wonderful collection, and a smaller portion of which are here in Philadelphia in the collection of the Barnes Foundation). Despite his antipathy toward the Impressionists, Gérôme is definitely worth a look for his technique as a painter, and for his interesting subject matter, including a classic scene in the Roman arena, Pollice Verso, which reportedly inspired Ridley Scott to take on the filming of Gladiator, and is generally accepted to be the origin of the “thumbs up/ thumbs down” image we have of the decision of gladiatorial combat, and by extension the use of the gesture in modern times. Another famous image by Gérôme is his two paintings of Pygmalion and Galatea, in which the sculptor’s creation comes to life (image above, lower right). Despite the fact that mainstream American audiences associate anime (Japanese animation) with giant robots bashing each other about while they tramp hip deep in skyscrapers, Japanese directors have long been willing to tackle sophisticated subjects that producers of American full-length animated features would never even consider. American studios are still under the impression (perhaps unfortunately correct) that feature length animation intended for theatrical release here must be “family fare” to have a broad enough appeal to make their box office. While I often complain about the adherence to simplistic formulas in American animation, anime is certainly locked into its own formulas at times, particularly in the area of science fiction; but from a genre whose ventures into science fiction have been largely near future and post apocalyptic adventures populated with robots, gynoids and exoskeleton mecha, comes an eye-popping exploration of the unconscious. Renowned anime director Satoshi Kon has adapted Paprika from the science fiction novel by Yasutaka Tsusui, about a device that allows psychiatrists to immerse themselves in the dreams of a patient. In the story a reserved psychiatrist/inventor uses a prototype of this device to venture into the dreams of patients, where she is represented by a fairy-like avatar, until the machine is stolen, leaving her trapped in the psychedelic landscape of the dream state, confronted by the nightmare imaginings of the inner mind. You can see the groundwork for Paprika in Kon’s own work and in films like Otomo’s Akira, and Miyazaki’s Spirited Away, in which the borders of reality are flexed an rippled with the push and pull of events. Kon is best known here for Tokyo Godfathers and Perfect Blue. He also directed the less-well known Millennium Actress and the Japanese animated television series Paranoia Agent. Kon has said that he based the imagery in Paprika on his own dreams, and the trailer and preview images promise a cornucopia of fantastic and wildly imaginative scenes. Kon studied at Musashino Art University, majoring in Visual Art Communication Design, but his original interested in manga (Japanese comics) increasingly gave way to a fascination with animated film. He was influenced by the traditional anime classics, and Gundam style fare, but also by the hallucinatory films of American director Terry Gilliam. Many of Kon’s previous films have a tendency to wiggle the line between dream and reality. Kon also wrote the screenplay for the Magnetic Rose segment of Memories, which was directed and animated by Koji Morimoto. There in an offical site for Paprika, that includes a trailer and a gallery of images. The film opened in New York yesterday and opens in Los Angeles on June 1st. The hopes for a wider theatrical distribution, as usual for adult-themed anime, seem dim; and like most American anime fans, I’ll probably have to wait for the DVD release. American theaters, even on the art house circuit, seem clueless about the appeal and potential audience for films like this, despite the proliferation of bad, second-string anime on American television.